Henry Mackay Burrell was born on 13 August 1904 at Wentworth Falls, New South Wales, the third of five children and the only son. He was educated at Parramatta High School and entered the Royal Australian Naval College in January 1918. He gained colours for hockey and graduated in 1921. Becoming a Midshipman in May 1922, he rose to Sub Lieutenant in April 1925 and Lieutenant in July 1926. He served in a number of RAN and Royal Navy ships in Australian and European waters in the 1920s before specialising as a navigator in Britain in 1930. In the early 1930s Burrell served as navigating officer in HMS Pangbourne and HMA ships Tattoo, Stuart and Brisbane. On 27 December 1933 he married Margaret Isabel MacKay; they were divorced in November 1941. He was promoted to Lieutenant Commander in July 1934 and, after qualifying from an advanced navigation course in 1935, served in HM ships Coventry and Devonshire. The captain of Devonshire criticised him for being too familiar with sailors, but he thought the ship 'would have been more efficient if officers and ratings had been in closer touch’. He completed the course at the RN Staff College, Greenwich, England, in 1938 and was posted to Navy Office, Melbourne, as Staff Officer (Operations). After the outbreak of World War II, Burrell was concerned with the threat of enemy surface raiders in Australian waters and arrangements for convoying troop-ships to the Middle East. He was promoted to Commander in June 1940. Five months later Burrell went to Washington to join the Australian delegation headed by Richard Gavin (Baron) Casey at secret talks between Britain and the United States of America on the strategic situation in the Pacific. In January-April 1941 he served as the first Australian naval attaché in Washington. He participated in British-American staff conversations to develop a strategic concept for the still hypothetical entry of Japan and the United States into the war. Burrell took command of the new ']N-class destroyer HMAS Norman at Southampton, England, in September 1941. The ship’s first duty was to convey a British Trade Union Congress delegation to Archangel in northern Russia before joining Admiral Sir James Somerville’s Eastern Fleet in the Indian Ocean. Norman served in the Mediterranean in mid-1942 and was part of the covering force at the capture of Diego Suarez and the assault force at Tamatave and Majunga, Madagascar. 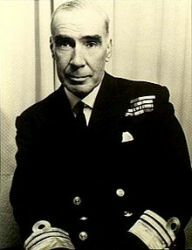 In February 1943 Burrell was mentioned in despatches for bravery and resourcefulness during the Madagascar operations. In September 1943 Burrell was again at Navy Office, Melbourne, as Director of Plans and on 21 April 1944 he married Ada Theresa Weller. In May 1945 he took command of the new Tribal-class destroyer HMAS Bataan, which joined the US Seventh Fleet and was in Tokyo Bay for the Japanese surrender ceremony in September, later assisting in the recovery of RAN prisoners of war from Sendai. Promoted to Captain in June 1946, Burrell was appointed Deputy Chief of Naval Staff in October. A major focus of his work for the next two years was to form the Fleet Air Arm and to introduce carrier aviation in the RAN. For twelve months from October 1948 he commanded the RAN’s flagship, the heavy cruiser HMAS Australia. He completed the 1950 course at the Imperial Defence College, London, and became the assistant Australian defence representative in London. In December 1952 he assumed command of the light fleet carrier HMAS Vengeance. Burrell was promoted to Acting Rear Admiral in February 1955, confirmed that July, and made Flag Officer Commanding HM Australian Fleet (FOCAF). In mid-1956 he was appointed to Navy Office to investigate a new officer structure for the RAN. In September he became second naval member of the Naval Board. He returned to the position of FOCAF in January 1958, flying his flag in HMAS Melbourne. On 24 February 1959 he was promoted to Vice Admiral and made Chief of Naval Staff in Canberra. Appointed CBE in 1955 and CB in 1959, he was elevated to KBE in 1960. As CNS, Burrell won approval to acquire Oberon class submarines, Ton class minesweepers, the survey ship HMAS Moresby and Wessex anti-submarine helicopters, and to commission the fleet tanker HMAS Supply. However, Burrell’s greatest successes were to convince the government to reverse its 1959 decision to disband the Fleet Air Arm and to buy three Charles F Adams class guided-missile destroyers from the USA. He retired from the RAN on 23 February 1962 to his farm, Illogan Park, on the Shoalhaven River near Braidwood, New South Wales. Burrell passed away on 9 February 1988 in Woden Valley Hospital, Canberra, survived by two daughters and a son from his second marriage. Edited from the Australian Dictionary of Biography entry by Sam Bateman.